Can the Leopard change her spots! 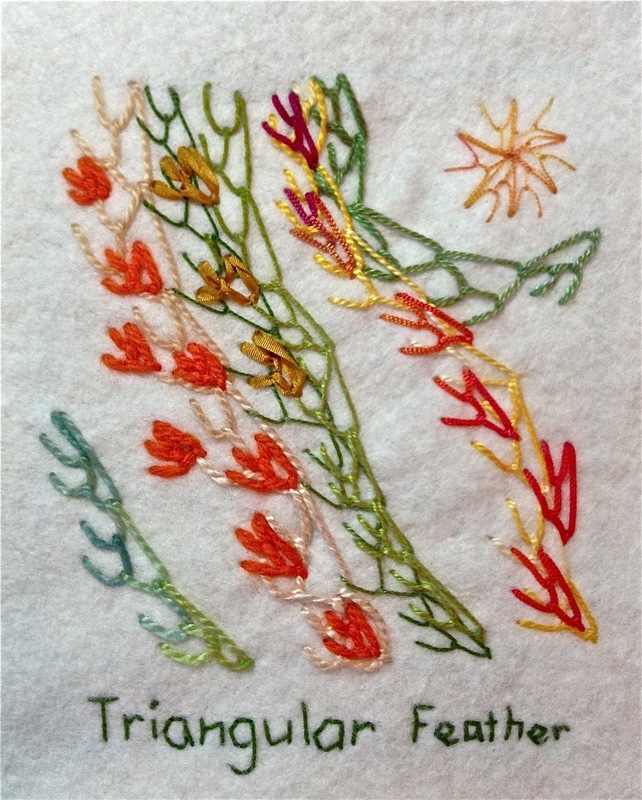 This week's stitch was the Triangular Feather Stitch. I really liked what I could do with this stitch. Last week's stitch was the Raised Herringbone Band. I liked what I did until I used water to get rid of my water soluble lines. I just don't seem to learn that unless I know for sure, I shouldn't use red thread. I'm having problems with my blogging, so I need to get this posted and quit. I have too many other things to do right now!!!!! I am finally posting again. I am trying to decide what projects are important to do this year. I still want to participate in Take a Stitch Tuesday. I still have quite a few stitches from the end of last year to do, but I have decided to slowly add those after doing the one for any given week. I also considered doing more than one stitch on my 4" by 4" felt sampler but decided that I still like the idea of only using one stitch to create the picture. So I will take my time catching up on the stitches I missed last year but that is OK. I still need to make at least 10 more. Below is a thread painting that is for one of my sisters for Christmas. I don't think she reads my blog, so I am OK to show it. I would like to do more of these with needlefelting as the background and more hand stitching when the machine stitching is done. I hope that everyone is getting their Christmas projects done. I had to give up on one of mine because of my illness. I will get that daughter something else. I am putting aside Take a Stitch Tuesday for awhile to do some Christmas projects. Now all I have to do is put two together and buttonhole stitch around them while adding stuffing and a ribbon! TAST 2012 Week 43 Buttonhole Wheel Cup and more catch up! I am actually on time this week with my TAST Stitch. Here is a picture of what I have done. I love how this looks with thicker threads. I really like the rayon ribbon on the bottom right. I also like the shine of the silk in the top right. Here are 3 more stitches that I finished in the last week or so. My eight year old son thinks the one above looks like a water bug. I used beads instead of a french knot for some of these stitches. Now I only need to do one more, and I will be all caught up! I finished this week's stitch: Beaded hedebo edge and also did week 32: cast on stitch. You can see them both below. 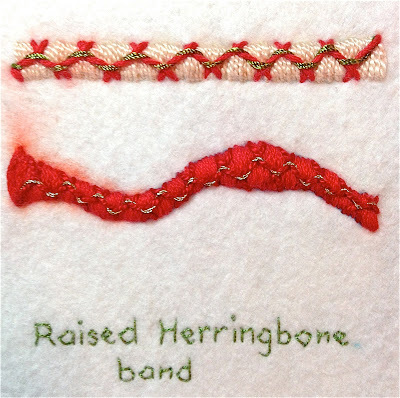 This stitch was satisfying to do as I saw the results--especially when adding the beads. This next one is the cast on stitch, which I love to do. I really love the texture of this stitch. What I really want is a very long and large sized milliners needle so that I can make them really long. Since my youngest child is in school now (no homeschooling this year) and my other children are all grown up, it looks like God has given me time to clean the house And to make fiber art!! I am very grateful for this opportunity. To God be the glory!